Acceptance is a 2014 novel by Jeff VanderMeer. It is the last in a series of three books called the Southern Reach Trilogy. It was released in the US on September 2, 2014. Acceptance jumps around in time and between the perspectives of several characters from the first two novels in the Southern Reach Trilogy. In the years before Area X, Saul Evans — the Lighthouse Keeper introduced in Annihilation — builds a friendship with nine-year-old Gloria, the girl who becomes the psychologist of the 12th expedition and the former Director of the Southern Reach. While maintaining the lighthouse (the same one found in Area X), Saul is frustrated by the constant visits of Henry and Suzanne, two members of the Séance & Science Brigade (S&SB) who perform unknown experiments involving the lighthouse's lens. One day while cleaning the grounds, Saul sees a mysterious flower of light on the ground. As he attempts to pluck it, it stabs his finger. Saul begins to have vivid nightmares: he imagines walking into his lighthouse only to discover it has transformed into the Tower. When he awakens, Saul begins reciting the sermon written by the Crawler on the walls of the Tower. Gloria leaves to be with her father, and soon after fire breaks out on Failure Island, destroying S&SB's headquarters. Saul becomes increasingly obsessed with the sermon. Finally, Saul returns to the lighthouse at night and sees a glowing light emanating from the trapdoor beside the lens. Saul enters the light. When he awakens, he finds Henry and Suzanne's bodies beside him. However, a doppelgänger of Henry arrives and confronts Saul. The two eventually fall off the side of the lighthouse. Saul survives, but as he attempts to run away, visions of Area X flood his mind. Saul eventually stops running, having accepted defeat. Saul's clone — one of the first generated by Area X — continues to work as the Lighthouse Keeper. The second timeline describes Gloria's initial acceptance into the Southern Reach as well as her promotion to Director. She has a strained relationship with Lowry, the only survivor of the first expedition and the man responsible for organizing each subsequent journey into Area X. Without alerting anyone at the Southern Reach, Gloria secretly crosses the border into Area X with Whitby. She visits her childhood home, encounters the Crawler in the Tower, and visits the Lighthouse. Here, the Director finds a backpack containing the cell phone and plant first mentioned in Authority. Upon her return, the Director refuses to relate her experiences to Lowry. She begins planning the 12th expedition and interviews the biologist for the mission. It is then revealed that the Director has terminal cancer. She therefore decides to join the 12th expedition in the hopes of visiting Area X one last time. The Director also learns that the S&SB may have been involved in the creation of Area X. When she confronts Lowry about this, he refuses to admit it. Finally, the Director pulls out the cell phone she found in Area X, arguing that it belonged to Lowry and that it was used to communicate with Area X itself. Lowry looks at the Director in horror. The Director's story ends with her embarking on the 12th expedition as the psychologist. In her pocket is a letter written to Saul Evans, which she hopes to give him when they meet again. However, as seen in Annihilation, the Director dies before Saul can receive her message: an apology for never returning to the Lighthouse as a child, and her promise to always remember him as the Keeper of the Light. Control and Ghost Bird enter Area X through a previously unknown portal. They wander in the wilderness before arriving at Failure Island, where they encounter Grace. Grace reveals the reason why Area X grows so quickly: time moves faster inside the border. In fact, although Control and Ghost Bird have only been gone a few weeks, Grace has been waiting on the Island for three years. Grace also shows them the biologist's "Last Will and Testament," detailing what happened to her after the events of Annihilation: the biologist arrived at the Island in search of her husband, believing that the man who returned from the 11th expedition was a copy of her husband generated by Area X. The biologist instead encounters an owl which becomes her companion for the next 30 years. Eventually the owl dies, and the brightness that afflicts the biologist swallows her whole. Grace announces that the biologist is returning to the island. Ghost Bird — herself a copy of the biologist generated by Area X — encounters her original self, though the biologist has transformed into an enormous creature made of the landscape itself. Control, Ghost Bird and Grace decide that they will return to the Tower, where Ghost Bird encounters the Crawler. When she touches it, she sees the birth of Area X, as if it is its own universe. Grace shoots at the Crawler and accidentally hits Ghost Bird. Control, meanwhile, is dying, having been touched by the Crawler. He descends further into the Tower and ultimately jumps into the light awaiting him at the bottom. He seems transformed into a rabbit or hare, and is described as having paws rather than feet as he jumps. Grace and Ghost Bird exit the Tower and head to the border. They find the Southern Reach building abandoned. The two continue walking, not sure if Area X is gone, or if the border has expanded even further. 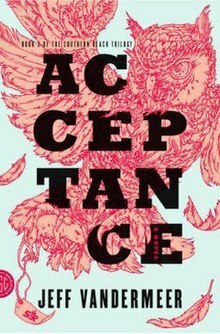 On March 15, 2014, Buzzfeed gave an exclusive first look at the cover to Acceptance along with an interview with Jeff VanderMeer. Reviews for Acceptance were for the most part favorable. NPR said that the book "is at different times the best haunted lighthouse story ever written, a deeply unsettling tale of first contact, a book about death, a book about obsession and loss, a book about the horrifying experience of confronting an intelligence far greater and far stranger than our own, and a book about sea monsters." The Guardian called it a potent conclusion to the trilogy while Kirkus gave the work a starred review. During its opening week, Acceptance was ranked as #16 on the New York Times Best Sellers List for Paperback Trade Fiction. The New York Times wrote a full page review calling the book "pure reading pleasure" and added that "VanderMeer has created an immersive and wonderfully realized world." ^ Bosman, Julie (February 10, 2014). "Impatience Has Its Reward: Books Are Rolled Out Faster". The New York Times. Retrieved June 7, 2018. ^ Michel, Lincoln (March 15, 2014). "An Interview With Jeff VanderMeer: 'Full Disclosure, I'm Really A Komodo Dragon'". Buzzfeed.com. Retrieved June 7, 2018. ^ Jason, Sheehan (September 2, 2014). "Accepting The Strange Brilliance Of 'Acceptance'". NPR.org. Retrieved June 7, 2018. ^ Roberts, Adam. "Acceptance by Jeff VanderMeer review – potent conclusion to SF trilogy". The Guardian. Retrieved 10 September 2014. ^ "ACCEPTANCE". kirkusreviews.com. Retrieved 10 September 2014. ^ "Best Sellers - Paperback Trade Fiction". The New York Times. September 21, 2014. Retrieved 12 September 2014. ^ Hutchins, Scott (12 September 2014). "Deciphering a Lost World". The New York Times. Retrieved 12 September 2014. This page was last edited on 10 February 2019, at 18:26 (UTC).